A natural emulsion for painting all interior walls. This virtually VOC free paint has a beautiful matt finish. 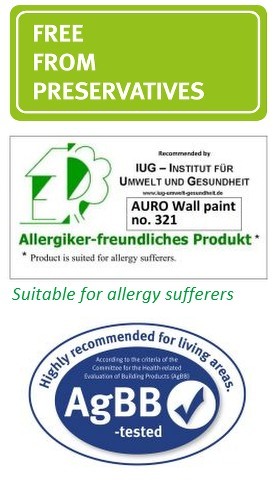 Auro 321 is an organic vegan friendly paint made from natural oils and resins like orange oil, eucalyptus oil, linseed oil and others it has a pleasant fragrance while painting. One customer recalled that it was "like having an aromatherapy session" each time she walked down her newly painted hall! Suitable for a wide range of internal surfaces including woodchip, mineral substrates, plaster, brickwork and concrete where they are clean, dry, stable and in good condition. Unfortunately colours are no longer available in Auro 321. Please consider the Auro 555 Emulsion for colours. Virtually VOC free, VOC Level: < 1 g/l. Natural, Organic & Non Toxic. *Replebin is an innovative, biogenic binder. It has been developed by Auro throughout a long term and complex research process. Replebin consists of plant alcohol esters with organic acides. This modern binder is legally protected and only available at Auro. For more detailed information, download 321 Technical Data Sheet and Safety Data Sheet (opens in a new tab). Certificate for "Medically Recommended for Lodgings". For Wood and Trim we recommend (within the Auro Range), Auro 935 Linseed Oil Based Gloss Paint (White). For surfaces that paint doesn't stick to easily and in situations where stains are coming through the walls, you might want to consider a using a Stain Block - either Auro 505 Fine Stain Block or Auro 506 Textured Stain Block. on highly or irregularly absorptive substrates we recommend priming with AURO 301 Natural Plaster Primer. Auro 321 can be thinned up to 10% max of water if required. 2-3 coats are generally required. Allow 4-6 hours between coats. You may also need Brushes or Rollers, Masking Tape and Paint Trays - see our Painting Accessories page. Brushes can be cleaned with Auro 411 Natural Brush Cleaner if necessary. Click the button below to add the Auro 321 White Natural Economic Emulsion to your wish list.